Did the romanian troops worn M28 dutch helmets after 1945 , with out the emblem of King Carol II? I think you were speaking of the M39 helmets. Yes M39 helmets. Did they used M39 helmets and russian ssh40 helmets in the same time? 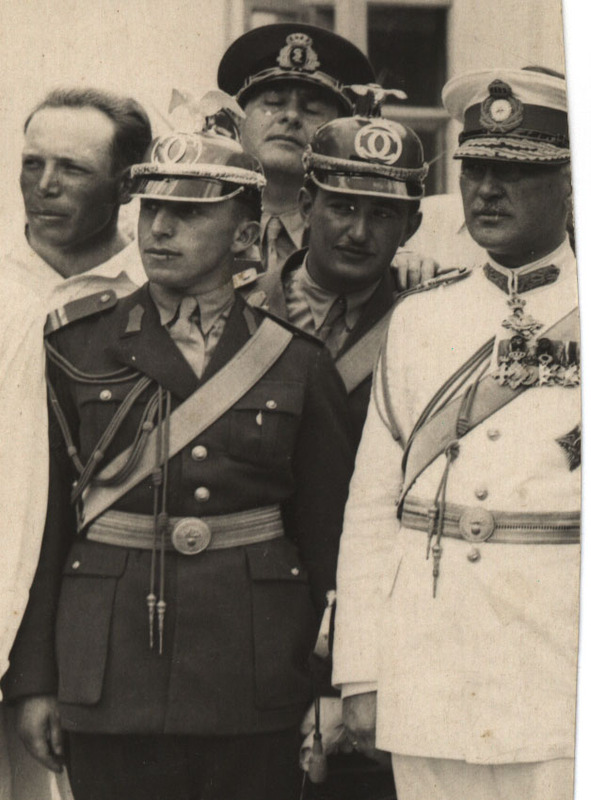 Who is the General standing to the right wearing the summer white dress uniform with the Order of Ferdinand at the neck and the order of Michael the Brave on the medal bar ? The general is wearing the insignia of a Grand Officer of the Order of Carol I, not that of the Order of Ferdinand I.
I think I have found him! General Nicolae Samsonovici, Chief of the General Staff (21.06.1927-11.08.1932) and Minister of Defence (11.08.1932-14.11.1933). Good job, Carol I ! Another (earlier?) photo of General Nicolae Samsonovici. Apparently he also served as Chief of the General Staff between 11.12.1934 and 01.02.1937. Officers helmets from the Frontier Border Guards. Both helmets are from the King Carol 2 period. Helmet #1 has the old version and short lived King Carol cipher from the early 1930's. Circa 1932. Helmet #2 has the new version of the King Carol cipher. Circa 1934-1940. The first helmet belongs to the 1st Frontier Guard (Graniceri) Regiment "King Carol II" (bears the typical cipher of this unit) and was carried between 10th of May 1933 and April 1941, for Ceremonial uniform. The second helmet was carried by all Frontier Guard regiments from 1930 till April 1941, on Ceremonial uniform. Both are officer helmets. Other ranks had similar helmets but with leather straps, as the German WW1 spiked helmets, instead of scales. Service visor cap - General of the Air Force. Circa 1935-1938. This visor cap is definitely not and Air Force head dress. From 1930 all Air Force personnel wore gray-blue uniforms. Light blue distinctive colour on a kaki (Army) cap was carried only by Gendarmes officers/generals. Vanatori de Munte dress Alpine hat - Major. Circa 1928 with King Ferdinand cipher. The two hat ornaments: feathers and pom-pom, were never carried together. The feathers were carried only on ceremonial uniform and the pom-pom, for gala uniform. The hat belonged to a Rifle ("Vanatori") Regiment officer, between 1930 – 1941, and was carried for gala or ceremonial dress. Even if this hat was worn during King Carol II reign, King Ferdinand cipher (double “F”) demonstrate that the officer was promoted Second Lieutenant during King Ferdinand reign. Mountain Rifles ("Vanatori de Munte") officers wore gray uniforms and berets, not hats. General of the Gendarne. 2 helmets. One with cipher and one without. The helmet without cipher was worn after King Carol abdicated the throne circa 1940. Both helmets were owned by General Radu Seinescu. Commander of the Military Gendarne (Military Police). The helmet of the left belonged to a Romanian gendarme officer (1912-1930), or a Frontier Guard officer (1908-1930). The cipher crown is missing and the general star looks strange. The helmet of the right is a German dragoons head dress (about 1900). Note the specific long spike. The original badge is missing and was replaced by a Romanian general sun. Officers dress helmet - Palace Guard Military Pompieri Company. (Military Fireman). Circa 1934-1940. This is a M.1930 Firemen (“Pompieri”) officer ceremonial helmet. The vertical plume should be in red small cut feathers. White horse hair plume was carried only by Rosiori officers. There is a difference between a Pompieri Fireman which is a civil servant (wore a different helmet) and that of a military Pompieri Fireman who were mainly made up of Artillery officers who were in charge of protecting the Royal Palaces. Commanding Colonel of the military Fireman. Notice the artillery tunic.